AMC has announced that Into the Badlands will end after the upcoming second half of Season 3 consisting of eight episodes. Additionally, The Son will end after the upcoming second season. AMC's groundbreaking martial arts drama Into the Badlands will conclude with its final eight episodes on Sunday, March 24 at 10:00 p.m. ET/9:00 p.m. CT following a new episode of The Walking Dead. The series will then move to its regular timeslot with a new episode on Monday, March 25 at 10:00 p.m. ET/9:00 p.m. CT.
As we enter the final chapter of Into the Badlands, an imprisoned Bajie warns Sunny that Pilgrim can't be trusted. But with his son's life on the line, Sunny struggles with his decision to help Pilgrim unlock the Meridian Chamber. Meanwhile, M.K., still reeling from the revelation that Sunny killed his mother, is hell-bent on revenge. Kidnapped by The Master, the Widow is forced to confront her past. Moon meanwhile races to save Lydia from impending death after she risked her life for his on the battlefield. As the last episodes unfold long buried secrets will be revealed, new alliances will be forged, and the saga will climax in an epic battle to end all battles. 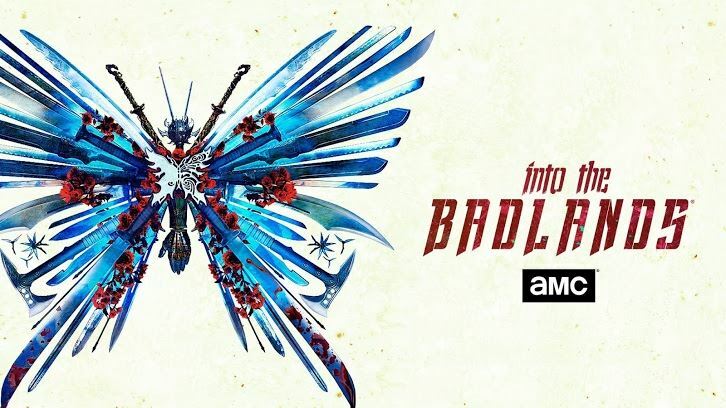 From AMC Studios, Into the Badlands was created by executive producers, showrunners and writers Alfred Gough and Miles Millar and is executive produced by Oscar(R)-nominated producers Stacey Sher and Michael Shamberg, along with David Dobkin, Stephen Fung, Michael Taylor, Karen Richards, Paco Cabezas and series lead Daniel Wu. The ensemble cast includes Wu (Sunny), Nick Frost (Bajie), Aramis Knight (M.K. ), Emily Beecham (The Widow), Orla Brady (Lydia), Ally Ioannides (Tilda), Lorraine Toussaint (Cressida), Sherman Augustus (Moon), Babou Ceesay (Pilgrim), Ella-Rae Smith (Nix) and Lewis Tan (Gaius). Based on Philipp Meyer's New York Times best-selling and Pulitzer Prize finalist novel of the same name, season two of The Son concludes the journey of the iconic "First Son of Texas." Eli McCullough (Pierce Brosnan) will stop at nothing to secure his legacy against the backdrop of the nascent oil industry of 1917. His tools are deceit, fraud and murder -- weapons he wields with the effortless skill of the Comanche warrior he once was. But the biggest challenge he faces will be quelling a civil war under his own roof, triggered by his idealistic son Pete (Henry Garrett). Eli knows the ultimate prize of American dynasty is nearly in his grasp, and time is running out. Meanwhile, in 1851, young Eli (Jacob Lofland) is now married and a respected warrior among the Comanches, but tragedy forces him into a leadership position as the vast Comanche empire crumbles around him. Broadening the scope, a 1988 timeline is introduced, bringing the McCullough saga into the more immediate past. Here, at age 85, Eli's granddaughter Jeanne Anne McCullough (Lois Smith) is confronted with a long-buried family secret. The Son is produced by AMC Studios and Sonar Entertainment. Showrunner and writer Kevin Murphy, director Kevin Dowling, author Philipp Meyer, and Sonar Entertainment's Tom Lesinski and Jenna Santoianni are Executive Producers. In addition to Brosnan, Smith, Garrett and Lofland, the series also stars Paola Núñez, Zahn McClarnon, Jess Weixler, David Wilson Barnes, Sydney Lucas, James Parks, Elizabeth Frances, Shane Graham and Kathryn Prescott. Deadline has revealed that Into the Badlands third 16-episode season was completed a while ago. The cast was released and a number of them have taken on new acting gigs. The Son, as a Western, did draw respectable viewership though it was old-skewing. Additionally, I hear star Brosnon only had signed a short-term contract which is the case with many movie stars who do TV series these days. I was going to drop that season 3 returns 3/24 but it seems news has been released that season 3 will be #IntoTheBadlands last. I’m really sad at this decision. An incredible group of people made our show both infront and behind the camera and I’m sad that’s that. I promise it will be bloody worth the wait. The epic TWO night premiere begins March 24th on AMC.